Proper irrigation during the creation of the implant site is a fundamental element for successful bone integration of the implant and the overall outcome of the operation. Omnia offers a wide range of mechanical irrigation lines which are compatible with most Physiodispensers. Irrigation systems include a perforator, a roller or clamp for flow control, the fittings and an integrated peristaltic pump section. Omnia offers a wide range of mechanical irrigation lines which are compatible with most implant motor models. Irrigation systems include a perforator, a roller or clamp for flow control, fittings, and an integrated peristaltic pump section. The convenient terminal cap makes the connection of the irrigation line to the hand piece easy to achieve. 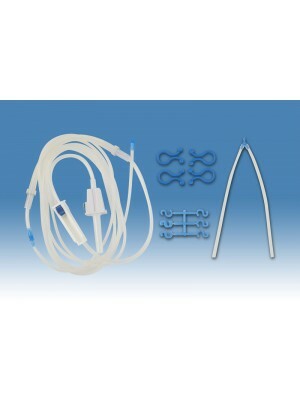 The cap allows you to connect Omnia tubes to the wide variety of cooling needle models available. The hose of the irrigation line is produced in constant section, realized to be used in medical field with characteristics of elasticity, high flexibility and transparency, so that the eventual passage of air bobbles in the water can be clearly observed. The hose is 230 cm long and its diameter is 1,5x3mm. The roller, a flow regulator by means of a roller, is mounted after the perforator and is used to regulate or stop the flow of the solution. The flow regulation is assured by the roller itself. When sterile liquid cooling bags of ½ litre are used, it is suggested to open all the roller as the flow tends to decrease with the consumption of the coolant liquid. The tip is inserted in the final part of the phisiodispenser, and it comes with a practical cap which helps the connection of the irrigation line on the hand piece, allowing to connect Omnia irrigation lines with all the cooling needles used to cool the hand pieces, often having different diameters. The tap is used to regulate the flow, and allows to have an optimal control on the flow of the liquid. The tap is present only in irrigation lines REF. 32.F0139, 32.F0159 and 32.F0171. The peristaltic pump hose section is in soft silicon and allows an accurate flow and long duration of usage. The length of the peristaltic pump section varies according to the different Phisiodispenser, to adapt each irrigation line to the different peristaltic pumps available on the market.